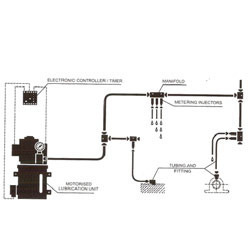 Our product range includes a wide range of lubrication system accessories, manual lubrication system, lubrication manifold, centralized lubrication system, lubricating manifold and central lubrication system. 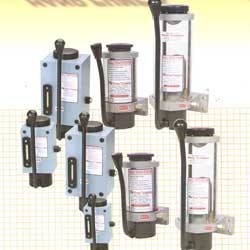 We are instrumental in providing a complete range of Lubrication System Accessories to our esteemed clients. These systems hold pre- set pressure settings which are usually require while accessing these units on machines. We are offering our clients a excellent range of Manual Lubrication Systems which are manufactured by our highly experienced professionals using high quality raw materials and latest technology. It is a piston type range of manual lubricating system in where the piston works as a cam. When the handle is operated, the oil get discharged by the hand pump. Further, when we remove the force from the table, we see the piston returning back and the hand pump starts sucking the oil and ultimately the pressure get reduced to approx 1 kg/cm2 . Additionally, when we operate the piston, the sucked oil ejected from the pump’s outlet under high pressure. Furthermore, this process can be achieved with the help of check valves which are located at the outlet and inlet and also at the pressure reducing system in the hand pump. We have gained expertise in manufacturing, supplying and exporting a complete range of Lubrication Manifolds. 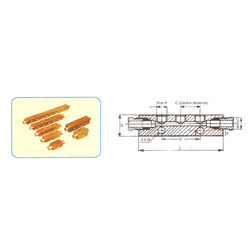 Manufactured by the professionals using high-quality raw material procured from the reliable vendors of the market, these manifolds are extensively used in various industrial applications. Further, we stringently test these products on various parameters to ensure zero defects. 1 m-1 way 35 one 18 15 m8x1 n. A. n. A. 2 m-2 way 55 one 18 15 m8x1 20 n. A. 8 m-1a way 40 one 22 22 m 10x1 n. A. n. A. 9 m-2 a way 65 one 22 22 m 10x1 25 n. A. We have emerged ourselves as a leading manufacturer, supplier and exporter of Applications of Centralized Lubrication System. Manufactured using high-grade raw material procured from the reliable vendors of the market in accordance to international quality standards. Further, we stringently test these products on various parameters to ensure flawless range of products. We have gained expertise in manufacturing, exporting and supplying a complete range of Lubricating Manifolds. 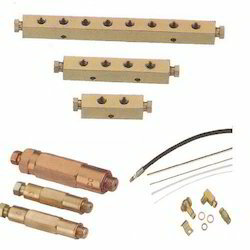 In these manifolds, the lubrication tube is directly connected to the manifolds which act as metallic blocks in order to mount metering injectors. 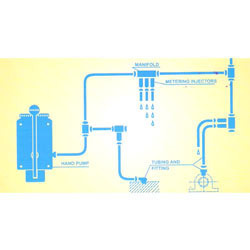 Available in various sizes, these manifolds have two ports and side outlets. 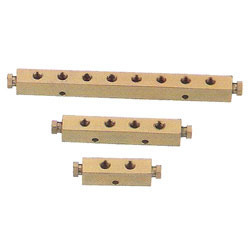 These ports are designed in order to join next manifold in the line with 6 mm od tube. We are one of the prominent names involved in the manufacturing, supplying and exporting a vast range of Central Lubrication System. Manufactured using optimum quality raw material procured from the reliable vendors of the market, these products conform to international quality standards and norms. Extensively used in various applications, these products are designed to meet the variegated demands of the customers. Owing to their longer shelf life, superior quality and excellent performance, these products are highly encouraged by the customers. Looking for Industrial Lubricators ?